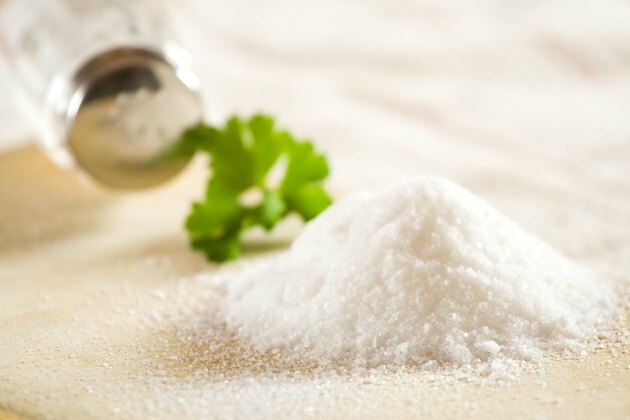 Does Too Much Salt Damage the Kidneys? The dietary sodium in table salt is essential to electrical nerve and muscle body functions, but over-consuming sodium is a health risk. When your blood sodium is too high from eating salty foods, your kidneys must work to restore a balance of electrolytes and fluids. If it remains chronically high, your kidneys can sustain damage that might not cause symptoms until their function is seriously impaired. The sodium in salt directly affects the amount of pressure exerted on the walls of blood vessels. As you consume salt from foods, the balance of electrolytes and fluid in your blood changes. Your kidneys excrete less urine, and retained body water shifts to the bloodstream, increasing the fluid in blood. Your heart must pump more blood and work harder, raising the pressure against blood vessels. Over the years, this action can stiffen and damage the blood vessels that serve your organs, including the kidneys. People who consume too much salt on a chronic basis cause the kidneys to struggle with electrolyte balance continually. Meanwhile, high blood pressure places vascular stress on the kidneys. In this compromised state, the damage to small blood vessels in the nephrons, the parts of the kidney that filter toxins and wastes from digested food for excretion, decreases normal kidney function. This loss of function, known as chronic kidney disease, may progress little by little for years or decades. Both high blood pressure and chronic kidney disease are incurable, so controlling your salt intake throughout life is an important preventive measure. Severe kidney damage requires life-sustaining hemodialysis treatment or surgical organ replacement to avoid death. People with chronic kidney disease also have greater risks for potentially fatal heart attacks and strokes. The U.S. Department of Agriculture recommends daily sodium intakes of less than 2,300 milligrams for healthy people without high blood pressure or kidney damage. That’s about 1 teaspoon of salt. Most Americans consume about 1,000 milligrams over that safe limit. If you have high blood pressure and related kidney problems, consume 1,500 milligrams of sodium or less. The quickest way to reduce sodium in your diet is to eat less canned, frozen and fast food. Why Do We Need Salt in Our Diet? Can a Salty Dinner Have an Immediate Effect on Blood Pressure? Can Salt Intake Affect Blood Pressure Immediately? Can Too Much Salt Cause Pain in the Joints & Numbness?